Rovamatic is not your typical saxophone sample library, but what else would you expect from a Rarefaction release. Rovamatic is a library without the multi-samples, velocity switches, pitch and tempo references found in more traditional instrument libraries. What we have here is a four-horned sound library showcasing the compositional and improvisational prowess of the Rova Saxophone Quartet. Rova has been on the forefront of improvised music for more than 20 years and their collective experience has been documented and preserved within this medium, especially prepared for your immediate use, abuse, manipulation, integration and inspiration. Read a RoVaMaTiC Review on eMusician. The CD-ROM version consists of 16 bit 44.1 kHz AIFF stereo sound files, ready for use in your digital workstation, sampler and performance applications and will mount on PCs (running Windows 95 or higher) or any Macintosh computer. 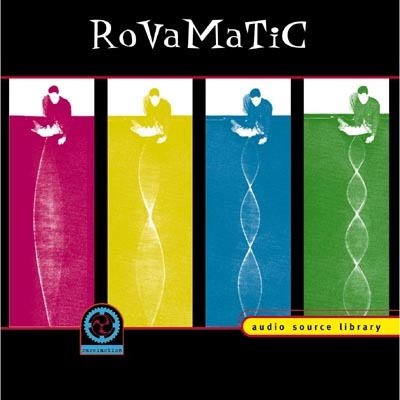 Rovamatic is also available on audio CD. Rarefaction is no longer carrying Rovamatic. Wander to Gench Music for information on where to purchase it. Thanks!